UK, 2013. 145 minutes, Colour. Helen Mirren, Richard Mc Cabe, Edward Fox, Haydn Gwynne, Paul Ritter. With its excellent performances, its cleverly constructed plot and, its fine, often humorous, dialogue, this film could also be described as ‘miraculous’. At least in this regard, that in its presentation of Queen Elizabeth the second and her audiences where seven of her prime ministers over many decades, it could actually make a staunch Republican very sympathetic to her majesty. This is a filmed version of a performance by the National Theatre at the Gielgud Theatre in London’s west end. It is one of the very successful series of National Theater Live, transmitted in the United Kingdom to a number of cinemas around Britain then, later, screened in cinemas internationally. The play was directed by Steven Daldrey (director of Billy Elliot, The Hours, The Reader). And what makes it particularly special is that Helen Mirren reprises her performance as Queen Elizabeth from her Oscar winning role in the film, The Queen. But one of the main contributions to the success of the play is the writing by Peter Morgan. Morgan has had a very successful stage, television and screen career, writing such films as The Deal, The Last King of Scotland, The Queen, The Special Relationship, 360. One of his greatest stage successes was Frost Nixon, also filmed. This film is a development of Morgan’s interest in the queen. It is pointed out that the queen meets her prime minister every Tuesday evening at 6:30 PM. What goes on is confidential but Morgan has speculated, given a lot of facts about the queen and the prime ministers concerned, as well as the historical context, what might have occurred in some of these audiences. In fact, he offers great insights into the prime ministers themselves as well as into the queen and her attitudes towards them and her dealings with them over 60 years. 12 prime ministers have served during her reign. There is a great deal going on in the background of the play. An Equerry appears throughout the film, explaining situations, describing the rooms where the audiences take place, setting the scenes, ordering the servants about. There are a number of servants who serve tea, show people in, and gather around the queen at key moments while the audience is looking at other characters and transform her with dresses and wigs to move from one era to another. One device for distracting attention is the presence of a young girl, Nell Willliams, as the young Elizabeth, revealing something of it what was like discover that she was going to be heir to the throne, what her life was like in being privately tutored with Princess Margaret, with the formalities in addressing her mother and father, her wanting to go outside into fresh air, her being in the girl guides, her rather determined approach to do her life, especially with the restrictions that have applied from the time her father became king. There are scenes where the older queen and the young princess discuss what it is like to be queen. Helen Mirren gives a very fine performance, rather theatrical in its style, due to the performance on the stage with a live audience giving its responses, both laughter and applause. But one sees her versatility, especially with the play opening in the 1990s, reverting to 1952, then moving backwards and forwards depending on the prime ministers who were participating in the weekly audience. This election of prime ministers who appear onstage is intriguing in itself. The big absence is Tony Blair, though there are some disparaging remarks are made about him and some jokes at his expense, especially with the Gordon Brown. David Cameron does indicate some admiration for Blair. What Morgan has done is sketch each of the prime ministers, highlighting their personalities, their political stances, their political experiences, especially within their own party, and he shows his skill in being able to give a significant impression in a comparatively short time. He also gives the queen some pointers about her longing for some kind of privacy, her political shrewdness in dealing with prime ministers and the way that she learned to do this, especially in the period of Churchill and Anthony Eden. Over the decades she comes particularly wise, particularly astute, not always agreeing with her prime ministers but constitutionally bound to support them. This offers particular insights into the queen and her stances, her sense of duty, her marriage and the Duke of Edinburgh, her love of the Britannia, her devotion to the Commonwealth and her admiration for several of the African leaders. The first prime minister we see is John Major. This is a very interestingly written sketch and performed showing significant diffidence in Major by Paul Ritter. It indicates Major did not expect to be prime minister and found his experience draining, and would have preferred a life with cricket, because he did not do well in school. The queen is sympathetic to him but realizes that he is out of his depth in his leadership. Audiences will be pleased that Major makes a second appearance during the play. He is followed by Edward Fox as Winston Churchill in his latter days, presuming on his past and his reputation, talking down to the young queen, who shrewdly points out that in delaying her coronation, allegedly for experience, he will not be able to resign or be an ousted because of his commitment to this important invent in British history. There is some humour with Gordon Brown and his exasperation with Tony Blair, in his realising that he was not as good at being prime minister as he expected, and perhaps might have been better being an academic. And he knows he will be defeated at the coming election. On comes a blustering Richard Mc Cabe as Harold Wilson, audiences expecting some kind of clash between the Labor leader and the queen. In fact, the initial meeting is not so successful, with Wilson going on and on about his background in Huddlesfield, the Labor party, his expectations about the queen and her political stances. However, Wilson makes two more appearances, becoming more and more comfortable in his interactions with the queen, after initially having a photo taken with her on his first visit, the queen looking particularly stone. But then they are on holidays in Scotland, at Balmoral, and an easy interaction has set in, Wilson very much at home with the queen, considering her a lefty at heart. She enjoys his company. Later, when David Cameron rather indiscreetly asks whom she got on best with, the Equerry indicates that he knows who it was - and Harold Wilson comes in again, showing his signs of increasing senility and Alzheimers. The queen is genuinely concerned, and indicates to him that she and the Duke of Edinburgh would be happy to accept his invitation to dine at Downing Street. Audiences have been waiting for Mrs. Thatcher to arrive and they were not be disappointed. 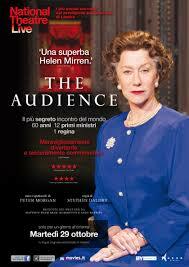 Hayden Gwynne is quite impressive as Mrs. Thatcher. It is a very interesting section of the play, the queen clearly not getting on well with Mrs. Thatcher, disapproving of her economic rationalism, hinting to the press that Mrs. Thatcher lack compassion and completely disagreeing with her stance on sanctions against South Africa. Mrs Thatcher gives her ‘no society’ speech. There are also some moments with Anthony Eden who considered the queen inexperienced in the mid-1950s and concealed from her French and British meetings with Israel concerning the Suez Canal and its management, and the ambitions of President Nasser. However the queen has done her homework and is able to challenge him on what has happened. Then, towards the end, the queen lists the prime minister and forgets one. James Callaghan bursts in to claim his place and that the queen not forget him. The film raises so many issues and indicates the passing of time with the Equerry in the 1990s trying to deal with his large mobile phone and in 2013, the grandchildren putting an I- Pad in grandmother’s purse and its playing music themes to her bewilderment. In fact, in the play there are mentions of Baroness Thatcher’s funeral, Pope Benedict’s resignation period and the forthcoming birth of the new heir. So the film covers just over six decades. The audiences will enjoy the frequent wry remarks made by the queen, the gaffes made by the prime ministers, a lot of political jokes, comments about the family, pathos and irritation about Diana, false expectations about the marriage of Prince Andrew and Sarah Ferguson, comments about the ups and downs of the popularity of the royal family. And the corgis make several appearances. With the quality of the play, the performances, the insights into British politics, The Audience would repay more viewings.